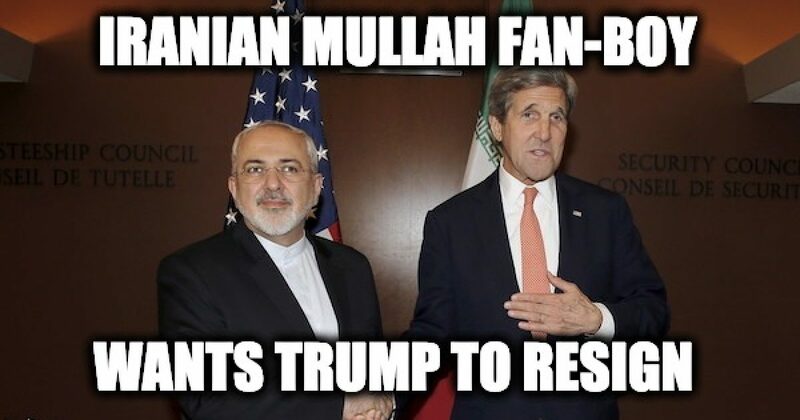 That’s right, the man who during his tenure as secretary of state sucked up to the Iranian Mullahs and did his best to make this great country seem weak is calling for President Trump to resign. What is John Kerry even doing in Davos anyway? The only thing he’s done since he left office is violating the Logan Act. Last January Israeli Newspaper Ma’ariv reported John Kerry sent a message to Palestinian Authority Pres, Abbas, “that he should stay strong in his spirit and play for time, that he will not break and will not yield to President Trump’s demands,” because Trump will be out of office within the year. Ma’ariv has learned that former US Secretary of State John Kerry met in London a close associate of Abbas, Hussein Agha , for a long and open conversation that contained many headlines. Agha apparently reported details of senior PA officials in Ramallah. A senior Palestinian official confirmed to Ma’ariv this week that there had indeed been such a meeting. Wrong again Kerry he’s still living at 1600 Pennsylvania Avenue, and you still care about your self more than your country. As Secretary of State he capitulated to the will of the Iranian Mullahs and now as a private citizen, he is still operating in the interests of foreign governments and against the American people. HIs trip to Davos is the third time that we know of that he has tried to destroy the policies of the United States government. I am not an attorney, but it sure seems like a violation of the Logan Act to me.